Thanks Snowboy and Krush for the invite to my first Holy Bowly! Pictured here is Cody Warble. Presented by Snowboy Productions and their sponsors Timberline Lodge, Lib Technologies, Monster Energy, Pisten Bully World, and Arena Snowparks. Check out my portfolio highlights by clicking the photo below. Just completed a virtual tour of the Crown Plaza in Lake Oswego for a Chicago Google agency. You can take the tour by dragging the photo above. Click on the photo below to check out my Instagram images. 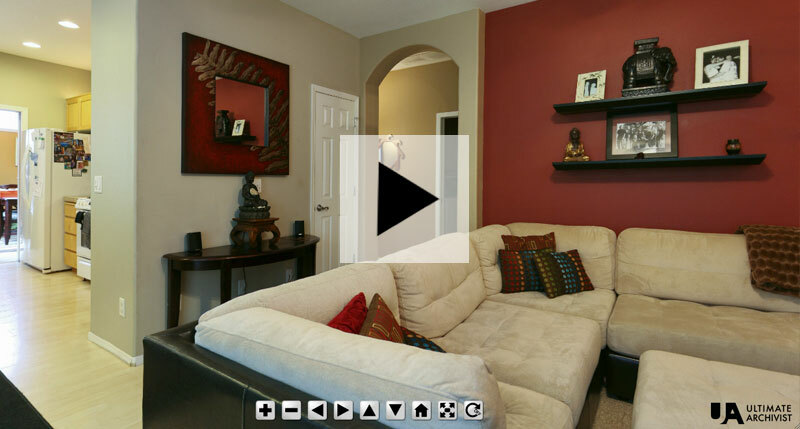 Just completed a virtual tour of the Aurora Colony Pub today for owner’s Janae and Cory. Like the color, and the atmosphere. You can take the tour by dragging the photo above. Made a quick photo road trip to Eastern Oregon after my annual slideshow at High Cascade Photo Workshop. Pretty much limited myself to the use of my 100mm lens to see what I could catch. Visited Shaniko, Antelope, Fossil, Mayville, Condon, Longrock, and Hardman for 2 days. See some of my results by clicking the photo above or at this LINK. 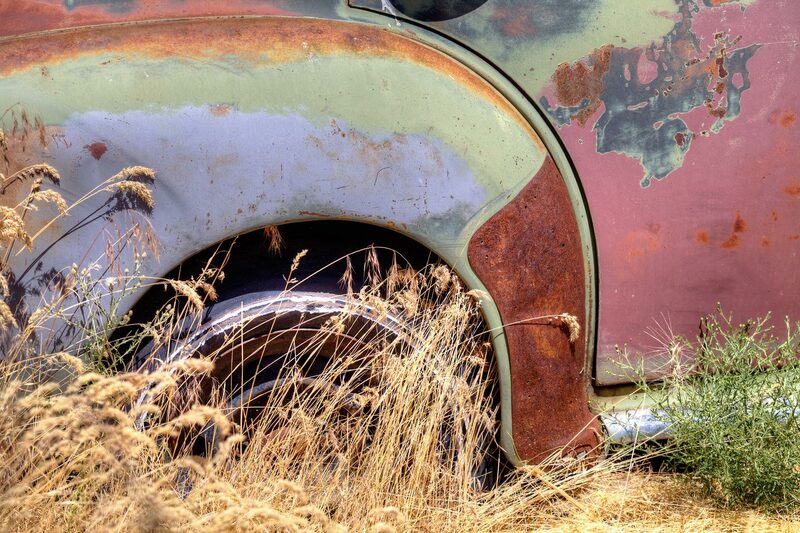 Did a quick virtual tour of this auto graveyard in Shaniko, Oregon. You can take the tour by dragging the photo above. I just launched a website that I registered several years ago. It basically features all of the businesses in my hometown that have Google virtual tours (most of which I shot). Those businesses (in no particular order) are Timeless Antiques, Highway 99e Antique Mall, Beyond Art, Corban Auto Repair, White Rabbit Bakery, Aurora Colony Museum, Pheasant Run, Scattercreek Junction, Home Again Antiques, Main Street Mercantile, Aurora Lamp Works, Aurora Outdoor Power, Aurora Mills Architectural Salvage, South End Antique Mall, Aurora Antiques, Time After Time Antiques, Aurora Family Health and Maternity Care, Aurora Colony Vineyards, Langdon Farms Golf Club, and Aurora Family Dentistry in Aurora, Oregon. You can click the photo above to see the website or CLICK HERE to view it. The Pinot Noir grape is one temperamental fruit. To thrive, it needs a particular climate found in Burgundy, France and, coincidentally, where the 85-acre Sokol Blosser estate resides in the Dundee Hills of Oregon. Higher elevation, warmer nighttime temperatures and less low-elevation fog help protect our grapes in the iron-rich, fertile and well-drained red Jory soil of the Dundee Hills. Photographed McMenamins while I waited for my daughter to be finished with her dance class tonight. I recently became the Ultimate Archivist. 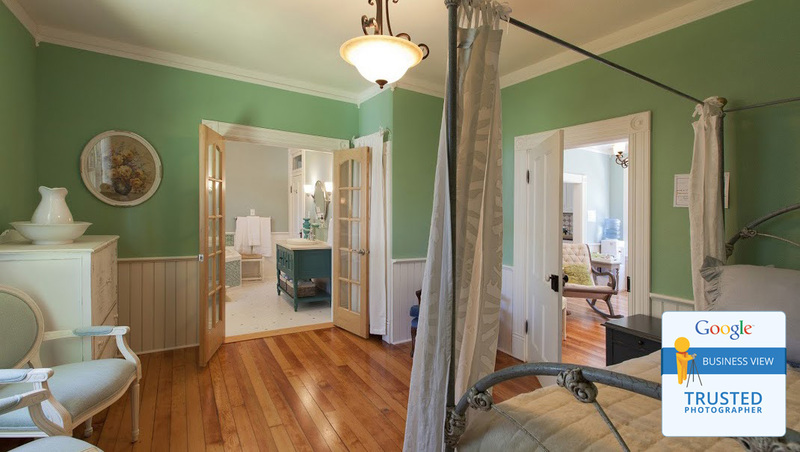 I can provide panoramic inventory tours for family homes and businesses. 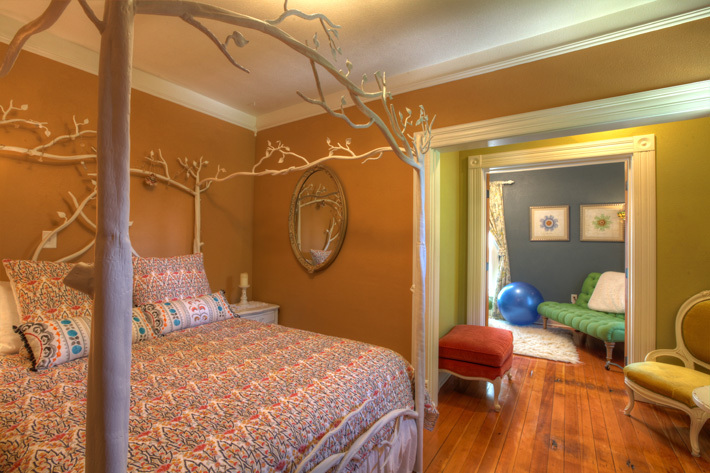 Check out the pano below and let me know what you think. I am honored that TWS chose my photo of Craig Kelly (RIP) for their “Celebrating 25 years” issue which hits the shelves pretty soon. The photo was taken in Truckee, California about a week after a freak snowstorm on Halloween in 1989. 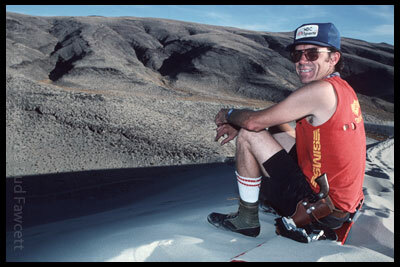 Burton had a team house where Jimi Scott and others had built a small quarterpipe in the backyard. After about 3 attempts with a 20mm lens, I got the shot of Craig that I wanted. It’s always fun to go back to other images from that day and see who else was on the scene (l-r) Jeff Davis, Jimi Scott, Jason Ford, Noah Brandon, Alex Warburton, Jimi Scott, Jeff Davis, Craig and Craig. All Photos by Bud Fawcett. Soundtrack credits: Fire Number 9 by Meat Beat Manifesto, 15 Steps by Radiohead, Highway to Hell by AC/DC, Lil’ Devil by The Cult, No More Tears by Ozzy Osborne, Jane’s Addiction Cover by Puracane and Papa’s Got a Brand New Bag by James Brown. After many years of avoiding personal requests for many of my snowboarding photos, I finally decided it’s easier to set up an online shop rather than spitting them out one-by-one on my inkjet printer. I just got the 5×7 proofs for a test and the quality is really good. The B&W’s look like the real thing. Check it out. Go to this link. A new exhibit of the Bud Fawcett Photo Retrospective will start at the tasting room of the Pheasant Run Winery in downtown Aurora, Oregon. The photographer’s reception will be held at the opening from 6-10 pm this Friday, February 4. Food and a great wine sampling are available for a fee. This retrospective contains 16 images from 1985 to 2009. The reference prints are up to 10 x 14 inches on 12 x 16 glossy/luster photo stock. 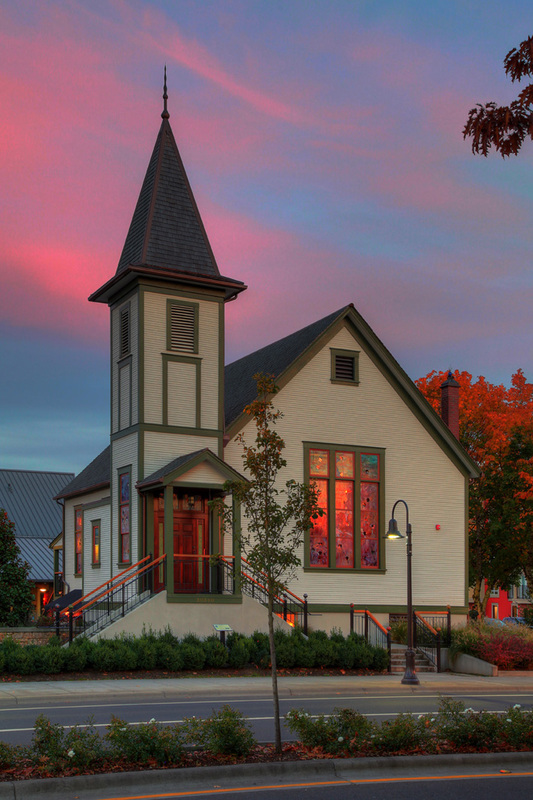 The Pheasant Run Winery Tasting Room is located in the old Aurora State Bank building at 21690 Main Street, Aurora, Oregon. You can checkout their website for wine selections and hours of operation. Happy New Year and welcome to my first gallery photo show. I chose images for this exhibit that represented those special ‘ah-ha’ moments in my photo career. I hope that you will come by and check out the prints in person and have some great coffee and treats at the White Rabbit Bakery (closed Mondays). If you can’t make it, please register at http://www.absolutelyradical.com and check out a sampling of images from the show. Thanks! Portland, OR (February 1, 2010) — The NIKE SNOWBOARDING sponsored project creates an elaborate alien structure to house the history of snowboarding. Nike Snowboarding’s Brand Director Michael Hernandez commissioned Portland artist Brian Elliot to build a futuristic time capsule with contents curated by NEMO Design co-founder and snowboard photographer Trevor Graves. Over the last several weeks the trio quietly put the ARIES2010 together in Portland, Oregon and are ready to launch on February 13, just one day after the Olympics opening ceremony. “ARIES2010 is snowboarding’s first time capsule, we want to celebrate snowboarding’s history, product innovation and personalities,” said Hernandez. Artists, photographers, iconic riders, and authors have contributed to the collection that tells the story of snowboarding. 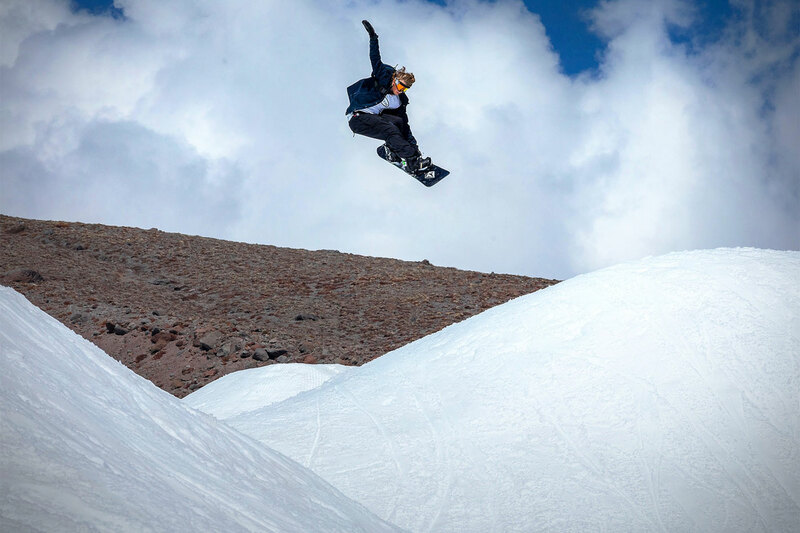 “The ARIES2010 show is about the nostalgia we all have for snowboarding’s history, but also embracing the new things that will give us that same feeling in the future,” said Graves. 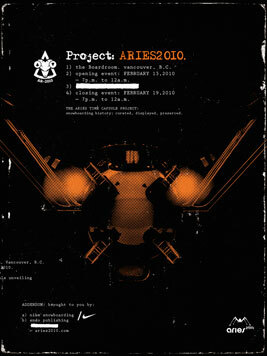 Vancouver’s The Boardroom will host the ARIES2010 physical capsule during its stay in Vancouver. The items to be housed in the capsule will be on display during two special events that connect snowboarding’s heritage to its future. The opening and closing receptions of ARIES will include presentations by snowboarding legends Terry Kidwell, Dano Pendygrass, Ken Achenbach and Barrett Christy. In addition, The Boardroom will host the ARIES2010 capsule in its window bank from February 13-19, 2010. Another classic issue of ISM with Ken Achenbach leading the tour of Mt. Bachelor as well as the first ballsy board test by Tom Hsieh and the crew of ISM. “This was the friskiest board tested, the Barfoot was as loose as a goose. Well who can forget those comments from the original board test. 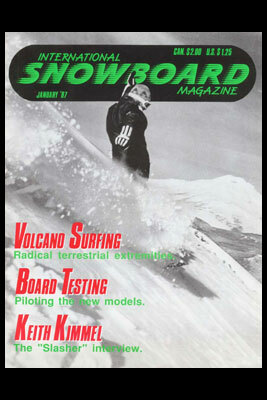 And of course the bonus of this issue was the one and only Keith Kimmel interview, not to be missed. This issue closes with a classic ad of Shaun Palmer on the back cover. Check out the full magazine on my issuu homepage. Maybe we were a little ahead of our time. Tom Hsieh had a visionary moment when he arranged a nightime snowboard photo shoot at Bear Valley, Mt. Reba, CA. 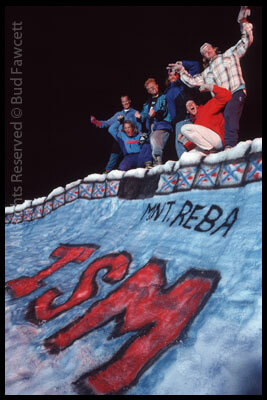 The crew was assembled (Mike Basich, Matt Schlingmann, Randy Walters, and others showed up for the scheduled two night clothing photoshoot and worked their asses off) … to be published in the Fall 1991 issue of ISM (never happened though since ISM closed their doors after the 90/91 winter season). Mike McDaniel and the crew of Bear Valley had the quarter-pipe and park (one of the first, I suppose) spray-painted for the event (obviously, this was before eco was smart). I shot about 15 rolls of film under a generator-powered Dynalite studio kit from the Bay area (which we blew up). Luckily everything was finished after the first night (till sunrise of course). And of course, the Mt. Reba painting crew made it all possible. Now this is truly a classic issue of ISM. Their first 4-Color cover in 52 pages; there was no turning back. 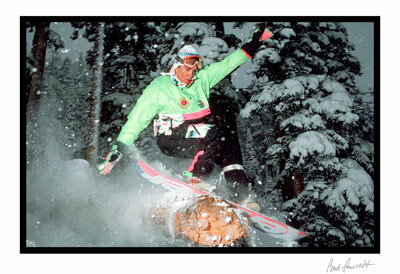 Check Out the following snowboarding stars of the eighties. You can look at the mag in flip-format here! 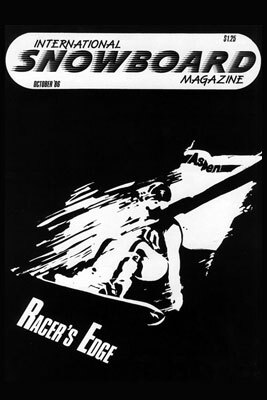 Originally known as Absolutely Radical in March 1985, International Snowboard Magazine was the first seasonal snowboarding magazine and proclaimed the “last word” until 1991 when it discontinued publication. 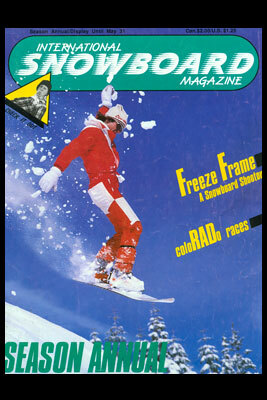 Brainchild of Tom Hsieh, Jr. of San Francisco, the October 1986 issue can be seen in its entirety in flip-format. Thanks for checking it out! 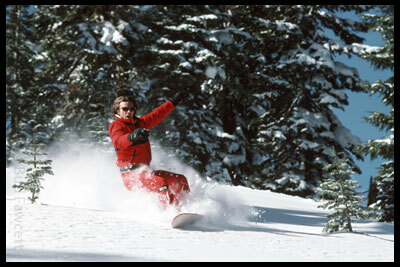 In 1978, resorts in California’s Lake Tahoe basin hadn’t realized snowboarding’s potential and refused to allow snowboards on their mountains. 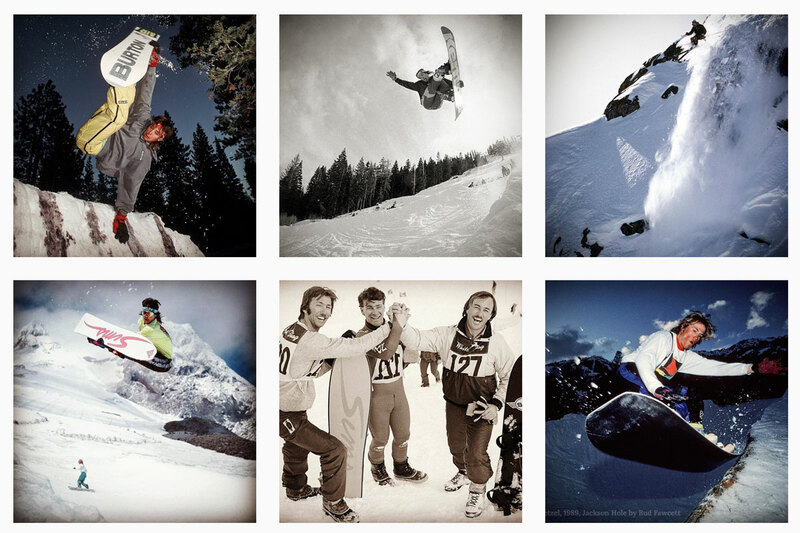 Because of this, snowboarders spent most of their free time searching for good spots to ride. “Back then not everyone in high school had cars so we needed places to ride that were close by,” remembers 29-year-old Tahoe local Bob Klein. Klein’s friend Mark Anolik was hiking around Tahoe City in 1979 when he discovered the perfect hit on land owned by the Tahoe-Truckee Sanitation Company. It was literally the city dump. No one is quite sure if the spot was a bend in a creek bed, or the edge of the land fill. 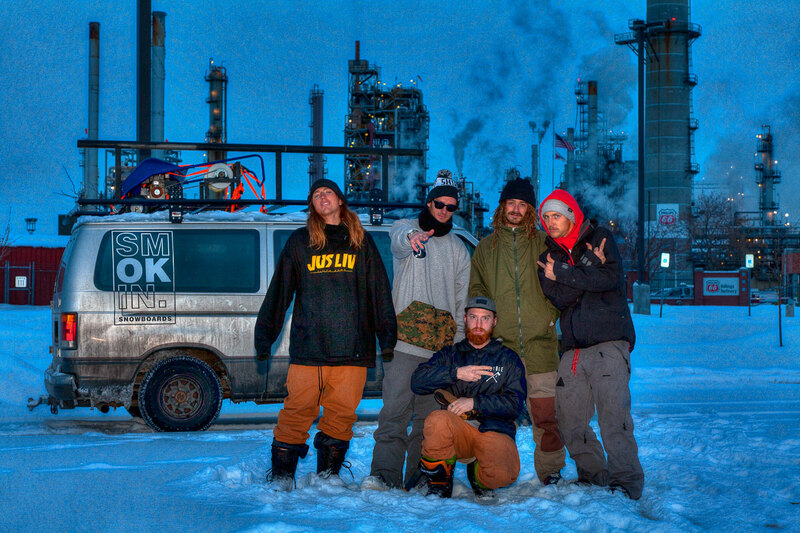 It had an entry and a couple hits, which was all these snowboard pioneers needed. Word of the pipe spread and within a few days Mark, Bob Klein, Allen Arnbrister, and Terry Kidwell were beginning to session the spot. They named it the Tahoe City Pipe. By the spring of 1980, thanks to a local phone company employee and skateboard fanatic named Mike Chantry, the pipe was exposed to the skateboard world. ”Mike Chantry took me there nearly blindfolded because Bob Klein didn’t want anyone to find out about it,” remembers Tom Sims, founder of Sims Snowboards. Over the next few years pro skateboarders Rob Roskopp, Steve Cabellero, and Scott Foss began visiting the pipe. Lensmen from Thrasher magazine and later International Snowboard Magazine were close behind, not as much for the pipe, but because of the people who were there. 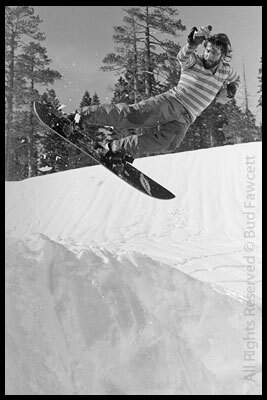 Along with Terry Kidwell, Bob Klein and Allen Arnbrister of Tahoe City, Keith Kimmel was one of the original pioneers of modern day snowboarding. 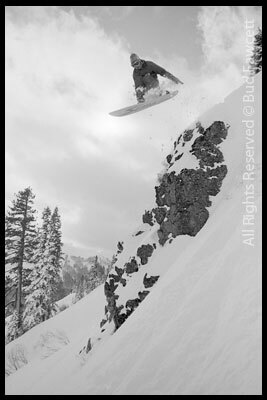 He was featured on the cover of the first International Snowboard Magazine (ISM) in March of 86, ripping the original Tahoe City halfpipe, a natural gully near the TC dump. In this photo, published in the ISM Interview and Thrasher Magazine, Keith is pictured here in one of the first “switchstance” moments in snowboard history. 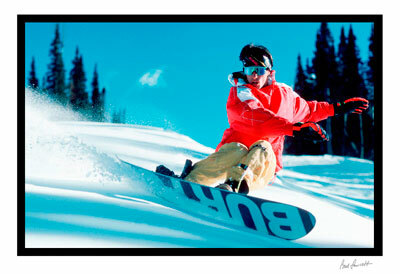 You can read more about the early days of snowboarding halfpipe here.